Even as a child he was like that. In school, during the class on fractions, he told the nun she was a liar and refused to listen. He was suspended for a week. He said, “You can’t have anything part-way.” When October came, he dressed up like a dictator for Halloween. He left his candy sack in the living room. That night, nobody heard him sneak downstairs. It wasn’t until morning that his mother missed the paring knife. Even at the hospital, he refused to show the doctor his newly-lined palm. I remember when I heard Michael Jackson died; I was coming home from my job as a telemarketer when my mom told me the news. Personally I felt indifferent, as at this point I was experimenting with electronic music and classic rock and to me MJ’s music was too commercial. 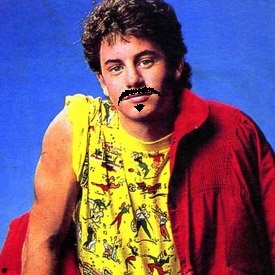 But for those of us who grew up during his heyday he was the next best thing since sliced bread. 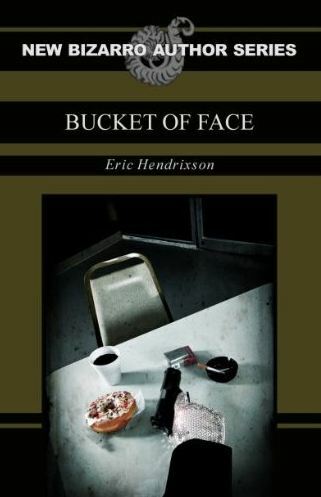 It is probably why when I read Eric Hendrixxon’s “Bucket of Face” I found myself laughing and also understanding I was in on a joke that few would get. “Bucket” Tells the story of Charles, a doughnut shop night clerk who dreams of better cigarettes and a better life for his girlfriend (a sentient kiwi fruit). It is when he witnesses a shootout between two Mafia members (who also happen to be sentient fruit, in this case, a banana and an apple) who leave behind a briefcase of money and the titular bucket that he finds his ticket to a better (and flavor country filled) life. There is a catch though. There is a Tomato hit-man who wants what he has and will stop at nothing to get it. Right off the bat Hendrixson does not spend a lot of time giving you a backstory on how the fruit in the story became able to walk and talk. Instead he pushes us headlong into the universe he has created and does not pull the brakes until the final page has rolled. The book is also laugh out loud funny in a Douglas Adams, Robert Rankin, Terry Pratchett sort of way. It is this off kilter sense of storytelling, that makes this book a must read for all Bizarro fans. For a first effort, Hendrixson does not show a single iota of worthlessness. His prose is quick, snappy and quirky. My only complaint is that it ended. So, if you want a fun read for that short break between classes or that bus ride to that convention, get this book. Bravo, Eric, and here’s hope for a sequel! There’s a town where all the ugly women go, slipping away at different times. Some, retreating from a high school dance, walk alone to the parking lot, to an ugly brown station wagon, taking a right after the post office, down the street that only the postman returns from. Some women get there late, smelling of smoke and stale beer, gin, bourbon and used latex. Some come in taffeta dresses or cotton housecoats, some in rolled up jeans, some scarred and naked, but most of them show up in sweats. The postman says the streets are empty in the town of ugly women, but he delivers catalogs, magazines, and boxes from all over the world. He never carries any letters back. Soft voices whisper every time he leaves, and to this day he’s never looked behind him. After sunset in the town of ugly women, they light a fire in the broken fountain outside of city hall, using a stack of bridesmaid’s dresses, self-help books, and returned Valentines, keeping the flames up with hairspray and control girdles. And a lot of the ugly women were in band, so some nights they play their flutes and clarinets, their oboes and tubas, their bass drums and trombones, and you can hear it all the way over to where everyone else lives. And nobody knows what the song is, but the music plays all night, a mix of instruments with nobody conducting. And when the ugly women dance, their shadows paint the mountains. The moon hangs horned, burnt orange in the sky. They stamp archaic patterns in the earth. They spread their arms and raise their lips to laugh. The fire paints their shadow on the mountains. Their bodies sweat like petals in the rain. These nights, the pretty women tie their husbands to their beds. The husbands kick and scream until morning comes. They seal their son’s ears off with candle wax. They lock the doors and keep the shutters closed.